Here’s a historical oddity I found by accident last week. It’s an article from the June 1948 issue of the pulp magazine Amazing Stories entitled “Fortean Aspects of the Flying Disks”. It appeared just a year after the term “flying saucer” was coined, in the wake of the Kenneth Arnold sighting (at the time this was the defining event in ufology, rather than Roswell – which as I’ve discussed elsewhere was strangely ignored despite being in the public domain). The Amazing article must have been one of the first to link the UFO phenomenon with the word “Fortean”. Interestingly, this seems to have been a minority view at the time. Today, the idea that UFOs are “Fortean” (in the sense of extraterrestrial, or at any rate beyond the understanding of science) is probably the first thing that springs to most people’s minds. But in those days, the prevailing view seems to have been that they were some sort of military technology produced here on Earth. 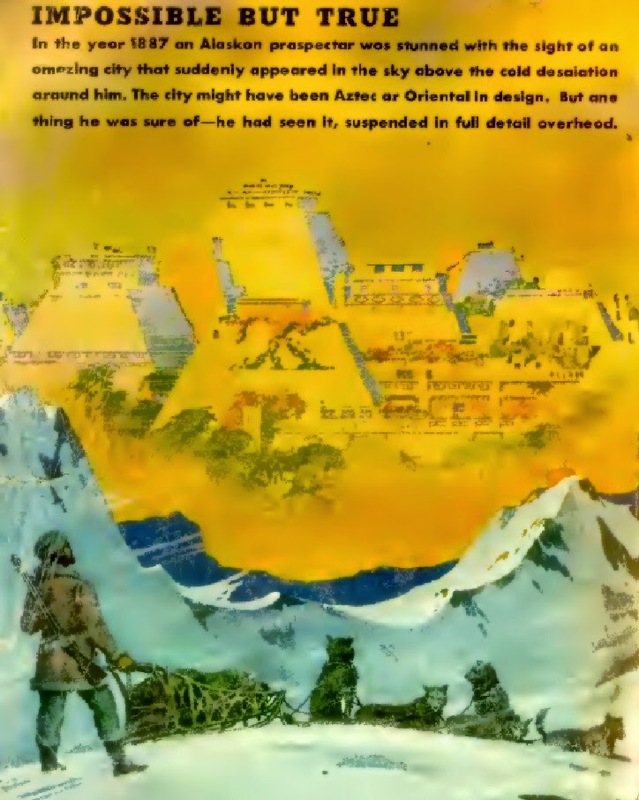 The author refutes this explanation by pointing out that, as recorded in the writings of Charles Fort, similar things were seen in the skies long before they could possibly have been produced by human technology. The author, by the way, was one “Marx Kaye” – which according to the Internet Speculative Fiction Database was the pseudonym of a little-known science fiction author named S. J. Byrne. You can read the article online at the Internet Archive (it starts on page 154 of the magazine). In fact that’s where I read it. I do own a few issues of Amazing Stories from the late 1940s, because of my interest in the Shaver Mystery, but not this particular one. Now that science has proved in so sensational a manner at least two phases of the Shaver Mystery, we have a prediction to make. We predict, based on evidence now in this editor’s possession, that it will be definitely proved that space ships are visiting the earth right now. The question arises, if space ships do visit the Earth, is it a matter of “national security” and may we talk about it? [...] Perhaps in wartime, our military would clamp down on all talk concerning military matters. But right now we aren’t at war with anybody, and we, in America, have the right of free speech and can talk about anything we please. For the benefit of those readers who are under the impression that there was a censorship on the now famous flying saucers, that’s just plain poppycock. There never was any censorship (other than that of individual newspaper editors who “laid off” of a subject that was beginning to look ridiculous). For more than twenty years we [i.e. science fiction magazines] have been talking about space ships, and maybe we’re right at last! But “authorities” who will get the first reports of the mysterious craft, when they appear, will think there is a “leak” if they read any old issue of Amazing Stories at all! Moral: More “authorities” ought to read science fiction – they won’t be so surprised by logical developments as they develop. For Christmas in 1978 (when I was 12) I received a book called 'Mysteries Of The Unknown' by Usborne books which featured that Kenneth Arnold UFO sighting over the Rockies(I think it was the Rockies) and it also talked about Project Blue Book but there was no mention whatsoever of Roswell and it wasn't until years later that I first heard of that incident - so even in 1978 it seems the Kenneth Arnold UFO sighting was regarded as the beginning of the modern UFO phenomenon and not Roswell. Ufology was so much simpler in the 1970s, wasn't it Colin? In those days it really was all about "unidentified flying objects", not government conspiracies and cover-ups! The Arnold sighting was in the Cascade Mountains in California, not the Rockies, but you're quite right that even at that point it was still considered the archetypal UFO sighting. The first book on Roswell, as far as I know, was "The Roswell Incident" by Berlitz and Moore, which appeared in 1980. I've always been puzzled why Roswell fell completely off the radar for 30 years, despite the basic details being in the public domain for anyone to dig up. I discussed this "Other Roswell Mystery" in some detail on Mysterious Universe last year (that's the first link in the above blog post).